Shingen was ill during the siege of Noda castle. The departure from Kofu prior to the siege was unusually slow because of this illness, and there was clearly worry about his health. After the fall of Noda castle, Shingen was unable to continue his military campaign, and withdrew to Nagashino, and it's said that Shingen went to Houraiji to recuperate, but when his condition didn't change, he packed up his army and returned to Kai. Shingen's sickness was a lung illness, and symptoms began to worsen. A skilled physician recommended a course of medical treatments and potions, however, day by day it became clear that this was an incurable disease. Now deathly ill, Shingen retired to Shinano province, Ina district, Ikkaneki-Komanba (Modern day Nagano prefecture, Shimoina district, Achimura city, Komanba). Near death, Shingen called his son Katsuyori to his bedside and said, "I have some small lands, and have invaded other districts and provinces, and for the most part have no regrets. However, the fact that I wasn't able to raise my flag in the imperial capital has been my most obsessive, if unrealistic, regret. If it becomes known that I have left this world, my enemies will take the opportunity to rise against you. Therefore, for the next three to four years, keep my passing a secret, and secure and fortify the defenses of the domain, build the military forces, and if you are ever in a position to take the capital, I will be satisfied." That was Shingen's final message. This was the 4th month, 12th day of the first year of Tensho (1573), and he was 53 years old. He had held the rank of Daizen Daibu Shinano no Kami, Jushiinoge, and his Buddhist name was Erinjidenkisangenkoutaikoji. 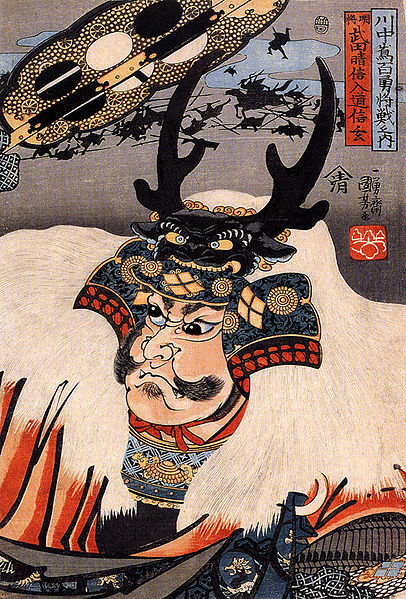 A hero of his generation, even Takeda Shingen couldn't defeat illness, and his ambitions disappeared like mountain mist. Great post and I hope this closes the deal on how Shingen passed away. It looks like Kyoto was his goal and failed. This is great information on Shingen's death. Thank you for posting. I heard before about Shingen's statement about posting a flag in Kyoto. But I had not heard before that he told Katsuyori he would be satisified if Katsuyori succeeded in this.